He marries the daughter of marshal Deeva, Julija Michajlovna (1791 Saint-Petersburg – 1838), of excellent and illustrious descent. The fairly strongly built and resolute countess de Lambert – an heritage of her ancestors – managed at the time of the passage of the Berezina on November 11 1812 to stop the fleeing hussars of her severely injured husband, crying to the desperate troopers on the run for the French, “Children, you’re not abandoning your injured general are you?”. By consequence the life of her husband was saved and the warriors were spared indignity. Julija Michajlovna countess de Lambert born Deeva also suffered from extreme shyness, bordering on the eccentric. 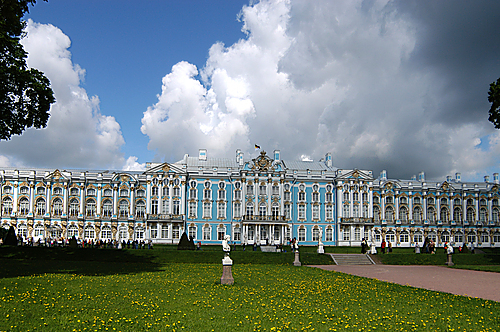 It so happened that, during the summer of 1831, she was living in Carskoe Selo, ‘Village of the Czar’, the residence of the czar near Saint-Petersburg. Her house was situated opposite the house of author Alexander Puškin, and she always kept curtains drawn, hoping she wouldn’t catch the eye of her famous neighbour, afraid as she was that he would “make critical verses on her”. The poet did not acquit himself well. According to some sources he gave her the nickname “madame Tolpege” (‘stupid, crass, unmannered person’). Moreover ‘he collected all kind of nonsense on his woman next door, the wife of general Lambert’, so that the fear of the latter may in some measure be considered as well-founded. In the end they became reconciled rather quickly. On August 25 1831 Julija Michajlovna, hearing of the eagerly awaited fall of Warsaw, hurried to Puškin to bring him as first one the news. As thanks he sent her the first copy of the brochure just come out ‘On the surrender of Warsaw’ in which his poem ‘To the slanderers of Russia’ was printed, with his signature. Soon a personal acquaintance followed and the brave Julija Michajlovna no longer avoided the first poet of Russia whereas he came to appreciate her intelligence and character.